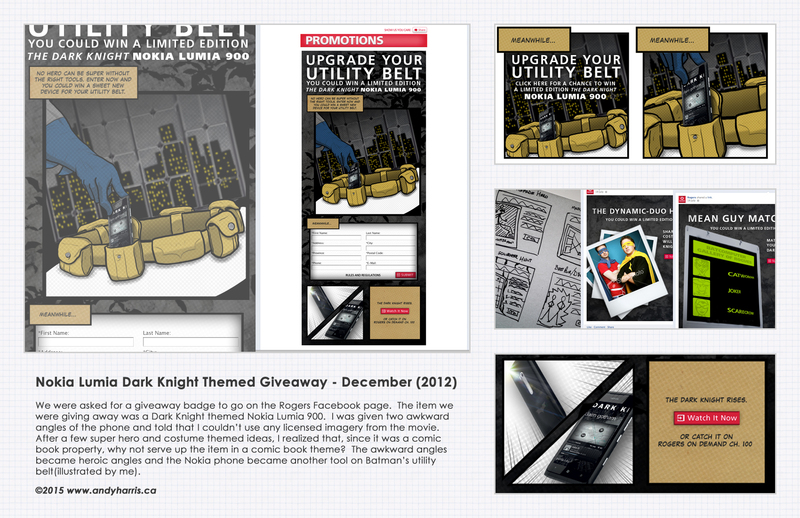 Nokia Lumia Dark Knight Themed Giveaway – December (2012) We were asked for a giveaway badge to go on the Rogers Facebook page. 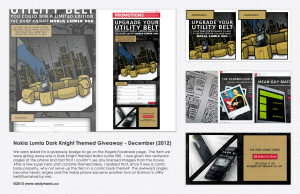 The item we were giving away was a Dark Knight themed Nokia Lumia 900. I was given two awkward angles of the phone and told that I couldn’t use any licensed imagery from the movie. After a few super hero and costume themed ideas, I realized that, since it was a comic book property, why not serve up the item in a comic book theme? The awkward angles became heroic angles and the Nokia phone became another tool on Batman’s utility belt.